It was bunker gear night. 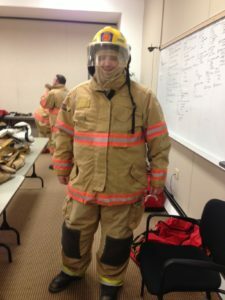 Bunker gear is the system of outer protective clothing for firefighters. “Bunker Gear” is derived from the fact that the trousers and boots are traditionally kept by the firefighter’s bunk at the fire station to be readily available for use. 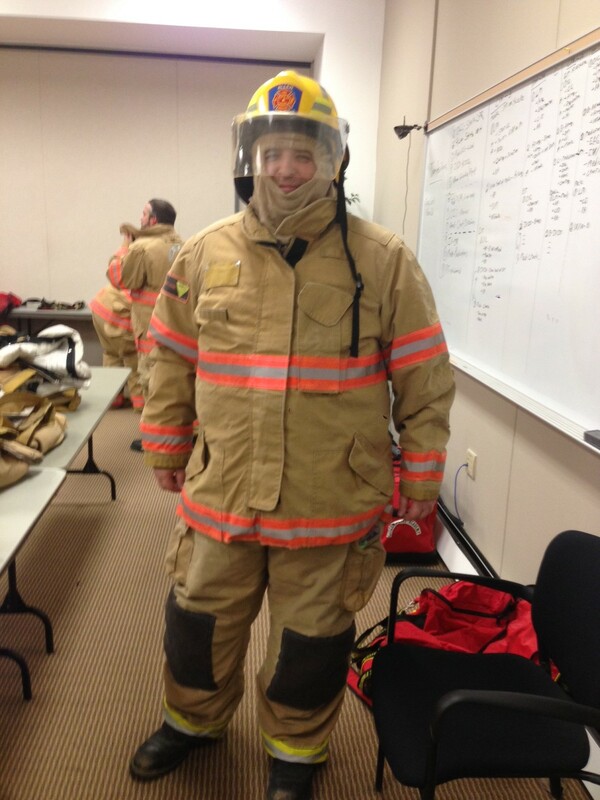 We were outfitted with the complete set of Trousers, Coat, Boots, Nomex Hood, Helmet, Gloves and Eye Protection. Boots – The boots are sized like a regular shoe and are made of black leather with steel toes. The boots are heavy due to the thick sole and plates to prevent punctures from sharp objects. The boots are the first item put on, kinda of sorta. You arrange your boots and trousers as an unit so they are put on at the same time. The trousers, when not in use, are scrunched down around the boots for efficient and fast access when they are needed. You step into each boot and pull up the trousers and suspenders. Trousers – The trousers are heavy and come with many pockets. Suspenders are worn to keep the trousers up. Coat – The jacket is a very heavy coat with lots of large pockets to carry tools and equipment. The coat and trousers have reflective safety stripes ensure that firefighters remain visible to each other. The coats have zippers and velcro to create a barrier from fire. Nomex hood – The helmets do not provide built-in protection for the ears, neck and the face. 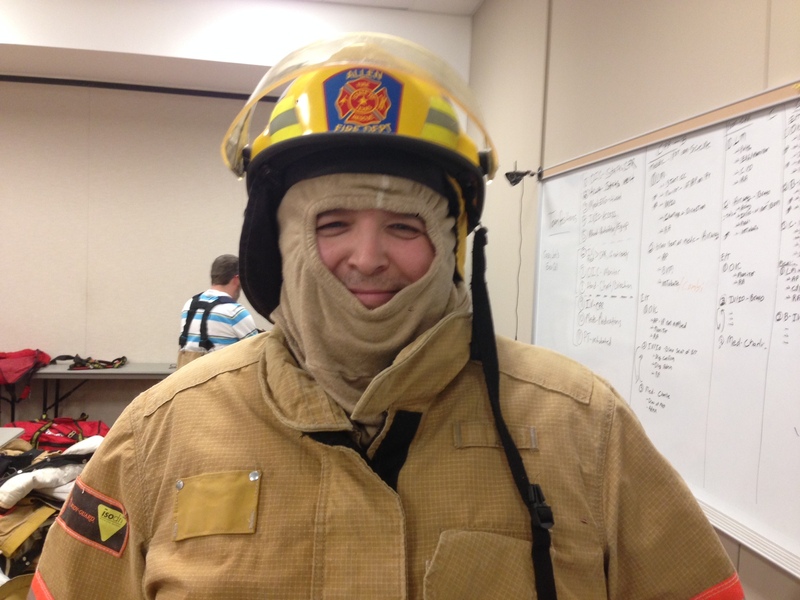 The nomex hood covers all areas of your head. It looks like the hood you see race car drivers using. The hood is tucked into the collar and the coat is put on and then the helmet. Firefighter helmet – The helmet is designed to protect a firefighter from falling debris and injury to the head while fighting a fire. We have to attach the helmet extremely tight. We have to be able to bend over and shake our head. The helmet has to stay in place. The helmet I received has a face shield, but we also have eye protection. Gloves – We have used two types of gloves. Regular work gloves and fire gloves. We use normal leather work gloves in situations where there is no heat/fire involved. For hose and fire work we will use the fire gloves. The entire setup weighs 25 pounds. It gets tiresome just wearing the gear. We will see how it goes on the first night we have to wear it for a couple of hours. Next week is extrication night. We get to rip into a car with hydraulic tools. Sounds like fun…..